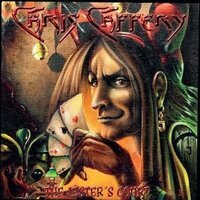 “The Jester’s Court,” is the fifth full-length solo album from guitar mastermind Chris Caffery. Until receiving this promo, I have never heard his solo material but as a member of both SAVATAGE and TRANS SIBERIAN ORCHESTRA, I figured I wouldn’t be find this new album disappointing. I was right. Musically, is a face melting riffs combined with simple but stellar song writing. He doesn’t venture into the more proggy elements of SAVATAGE nor is the overall sound as epic as anything from TSO. What I was greeted with, however, was Metal that borders on thrash with plenty of melodic and classic elements thrown in and even a bit of groove to keep things interesting. “Upon The Knee,” is a ripping opening track that immediately establishes the album as one filled with riffs upon riffs. Vocally, I found myself really impressed because Chris’s voice is clean but still very venomous and about as heavy as a person can get before going into true Extreme Metal territory. “1989,” opens with some 80’s style cheesed out keyboards but the rest of the song finds it too firmly planted into groove filled Metal. The crunchy thrashed infused riffs at 2:33 worked perfectly with his heavy handed vocal approach; this extremely heavy moment was a great bridge to the more melodic part up next that builds up into a short but sweet guitar solo that ends in a cascade of TICHY’s flashy drumming. The song isn’t done yet and goes into another moment of the riffs and solos trying to decide which one can play better. Chris Caffery has a unique ability to displays his gifts as a guitar god but he never comes off as pretentious or showboating. His song writing skills enables him to create these songs that work perfectly for his playing, thus enabling the listener to truly understand that the guitar is a natural extension of his body. The album continues to be solid all the way through; middle album cuts like “Inside My Heart,” and “Luna Major,” keep things flowing very well. The latter is an instrumental that is a full speed torpedo of riffage, drums, bass that hits hard and doesn’t let up. The former sounds like more modern era MEGADETH but with a more classic sound infused, especially in the chorus. Unfortunately, the album hits a brick wall with “Watch.” It is a clunky song that never really finds the correct footing, especially with the awkward chorus. “The Feeling of a White Lie,” brings things back in a grand way. The song is almost seven minutes long and really runs the gauntlet from soft, melodic sounds in the opening, a heavy mid-section, to an epic SAVATAGE like ending. One of the best songs on the album. Sadly, the album comes to a stop yet again with “Checkmate,” which is a weird and pointless interlude. The title track comes next and while it is a good song, a bland ballad follows it. With the title track sandwiched between these two weak tracks, I’m not sure if most people would listen thru all the way to the end. Still, the first seven tracks are really good and if you can make it through a few bad songs, the ending does have two great tracks. Had the experience been a bit more even, this album would had rated even higher.